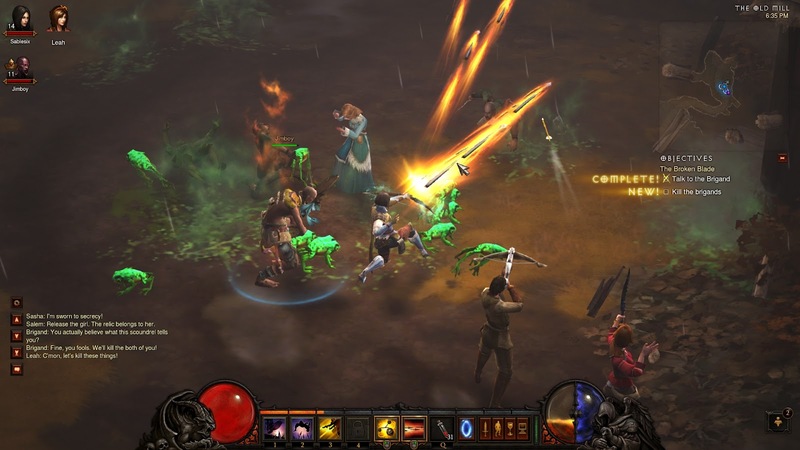 I'm- slowly- working my way through Diablo 3. I can't really say I've made a ton of progress. I just have a lot going on and so I'm only 15 with my Demon Hunter. Slacker, I know. I'm reading about other people who are already capped and I see my friends list full of big numbers. I'll get there, eventually. So, I really can't tell you much that you don't know, you probably know far more than I. But I can give some thoughts of what I think of D3 this far, maybe I'll luck out and can share some insight with some who don't yet play. I have been reading a lot about it in my feed while family and friends have been telling me things too. I really love grouping with people in D3. While it is a bit harder than solo mode it is really, really fun to just jump in and do whatever and still get credit. How many games offer this? This offers great incentive for grouping! The only problem I have is that sometimes I forget where I was in the quest log, I end up hopping around trying to remember where I was. It would be nice if it was marked [boldly, for someone like myself] making it bit easier for players to remember. If I don't log in for a couple of days I'm pretty much going to forget where I was. ...I've already forgotten the last paragraph I just wrote because chrome crashed on me- Thanks to that P.O.S. called Skype. Anyhow, let's see. Ah, yes. The world of Diablo feels alive and connected to me. I like that it is always online. I have plenty of offline games, it really isn't a huge deal to me. If the servers go down for a bit, well I have plenty of other things to do. That's my perspective. Plus, it is so easy to group and connect with friends. Much more streamlined than it once was. I also don't miss skill points, I like how runes work. I think this path for choosing how your class works is really nice and easier to get into. Re-spec as you like, whenever you like= Awesome. Re-spec your followers whenever= More awesomeness. Very easy to play around and try different things and not feel locked into choices. Overall I love how flexible D3 is, you can play casually and still feel like you're moving along. I think it is a really great game to hop into and have fun with. Eventually I'll catch up with the rest of you! Edit- Ah, I forgot to mention the story and the cinematics, they rock! I agree, I really miss some of the old aspects, while the game has grown it just doesn't feel the same. Now we just need guilds in D3, hehe.